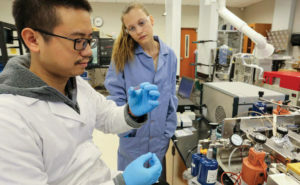 The National Science Foundation has released its latest survey of federally funded research expenditures, and five programs at the University of Alabama in Huntsville continue to be ranked among the top 25 in the nation. They are aeronautical/astronautical engineering (5th), economics (9th), computer and information sciences (10th), atmospheric sciences (11th) and astronomy (21st). In addition, UAH was named among the top research universities for funding from NASA (11th) and the Department of Defense (28th). UAH colleges and research centers manage nearly $94 million in research expenditures. Baptist Health recently was honored with the MAX Community Achievement Award for providing healthcare to the River Region. Gardendale Foodland took first place in the 2019 Buy Alabama’s Best Retail Campaign Launch Awards for its display featuring Alabama food products. The Hiller Companies Inc. is celebrating its 100th anniversary. Founded as a single shop in 1919, Hiller began in New Orleans, Louisiana, but as the need for fire suppression technology grew, the company moved its headquarters to Mobile. Today, the company has a global reach, with more than 20 offices around the U.S.
Rock Creek Golf Club, in Fairhope, was recently recognized by Golf Advisor as one of the “Top 15 Golf Courses to Play in Alabama” and was ranked no. 6 on the 2018 Best-Of List. Transomic Technologies, located on the campus of HudsonAlpha Institute for Biotechnology in Huntsville, has had its CRISPR whole genome arrayed library placed at McGill University, supported by the Rosalind and Morris Goodman Cancer Research Center. Troy University’s Sorrell College of Business is now one of just 189 colleges of business worldwide to hold dual accreditation from the Association to Advance Collegiate Schools of Business. The accreditation of the School of Accountancy was announced by AACSB in late January and the Sorrell College received accreditation in November, 2018. The Breast Cancer Research Foundation of Alabama presented its largest donation ever of $1 million to the O’Neal Comprehensive Cancer Center at the University of Alabama at Birmingham. In addition, research funding to UAB from the National Institutes of Health came in just shy of $300 million in 2018, ranking the university 23rd on the list of universities receiving NIH funding, according to Blue Ridge Institute for Medical Research. The University of North Alabama Department of Communications received a $25,000 scholarship endowment from the Country Radio Broadcasters Inc. in January. The scholarships will be used to recruit students to study mass communication and radio broadcasting. When IndyCar first signed with Barber Motorsports Park, critics weren’t so sure the race would be a success, especially since the track is located just 37 miles from Talladega Superspeedway. But in mid-April, the NTT IndyCar Series and Barber are celebrating their 10th annual race, the Honda Indy Grand Prix of Alabama, at the 2.3 mile, 17-turn road course.